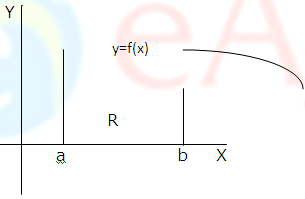 We have already learned to find the area of a plane region bounded by two curves which is obtained by integrating the length of a general cross section over an appropriate interval. Here we will see that the same basic principle can be used to find volumes of certain three dimensional solids. 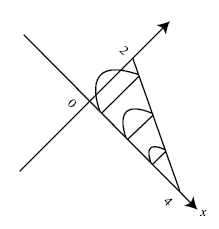 Let S be a solid that extends along the x-axis and is bounded on the left and right, respectively, by the planes that are perpendicular to the x-axis at x=a and x=b. We are finding the volume V of the solid, assuming that its cross-sectional area A(x) is known at each x in the interval [a, b]. V= a∫b A(x) dx provided A(x) is integrable. V = c∫d A(y) dy provided A(y) is integrable. In words, these formulas states that, “The volume of a solid can be obtained by integrating the cross-sectional area from one end of the solid to the other”. Example: Find the formula for the volume of a right pyramid whose altitude is h and whose base is a square with sides of length a. 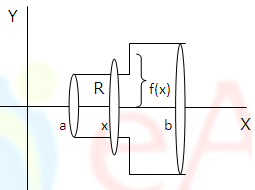 Solution: We introduce a rectangular coordinate system in which the y-axis passes through apex and is perpendicular to the base, and the x-axis passes through the base and is parallel to a side of the base. At any ‘y’ in the interval [0, h] on the y-axis, the cross section perpendicular to the y-axis is a square. If ‘s’ denotes the length of a side of this square, then by similar triangles. A solid of revolution is a solid that is generated by revolving a plane region about a line that lies in the same plane as the region; the line is called the axis of revolution. Example: Use cylindrical shells to find the volume of the solid generated when the region R in the first quadrant enclosed between y=x and y=x2 is revolved about the y-axis.